Android is everywhere. Its acceptance among manufacturer is increasing day by day.India’s home grown mobile manufacturer Micromax announces its next Android based mobile phone Andro A70. Micromax Andro A70 is well finished and fully enriched with 8.1 cm capacitive touch screen, 5 Mega Pixel primary camera, GPS, Wifi and firmed with Android 2.2 (Foryo) version. It should be better to mention that it’s a complete 3G phone with 7.2 Mbps HSDPA and a secondary front camera(0.3 MP) for video calling. Its expandable memory supports up to 32GB MicroSd. Andro A70 has one kind of a very unique feature called ‘MiFi”, which can be used like a WiFi router to serve up to 5 WiFi enabled mobile. So you are about to set up your own Wifi Hotspot, interesting na ? 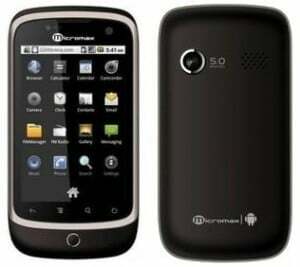 Micromax Andro A70 will be available at a price of Rs. 8000 (approx) in the last week of July,2011.Pre-ordering is now available on flipkart.